RexHYIP is evaluated a unique & modern HTML template for HYIP listing & directory Website with clean and trendy design. Includes full functions necessary and researched detail based on experience user. Designed on grid system, your site will auto responsive layout and look sharp on all screens. 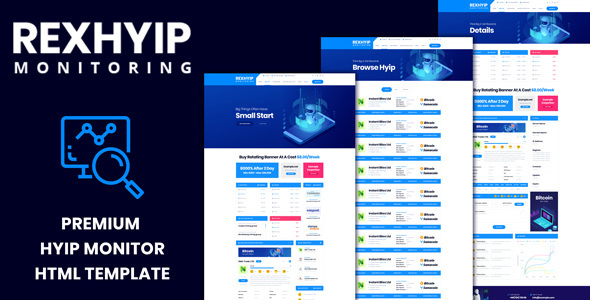 My package includes 14 well-organized HTML files and with this template you can use it for a lot of website such as HYIP Listing, HYIP Monitor, hyip website, all hyip monitor, hyip review, Hyip Listing, CryptoCurrency Listing, ALTcoin Listing….